Question:I'm interested in filling PDF form on existing PDF forms. All I really need to do is pull information from user input and then place the appropriate text over an existing PDF in the appropriate locations. I can already do this with some application by feeding the same sheet of paper into a printer, twice, but this just really rubs me the wrong way. I'm tempted to just personally reverse engineer each existing PDF and draw every line and character myself before adding the user-inputted text, but I wanted to check to see if there was an easy way to take an existing PDF and set it as a background for some extra text. I also realize that I could just scan the document itself and use the resulting raster image as a background, but I would prefer the precision of vector graphics. Is there easy solution to solve this matter on VeryPDF? Answer: According to your description, things is a little complicated, actually it is quite easy to solve. VeryPDF PDF Editor can help you fill PDF form on scan PDF form even if it is raster. You do not need to convert it to vector image. By this software, you can add a new layer to the flied to cover original text on PDF form. 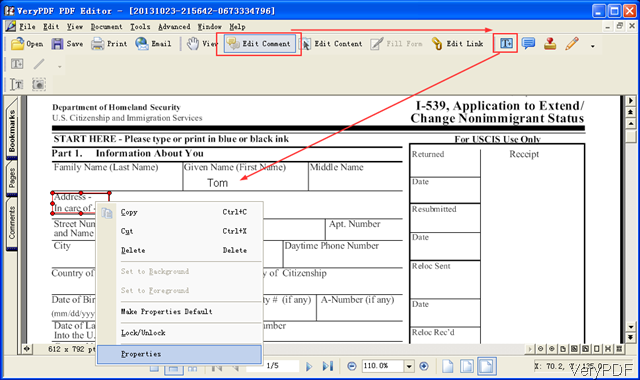 By this method, you can adding text over existing PDF file even if it is scan PDF form. Please check more information of this software on homepage, in the following part, I will show you how to fill PDF form. Step 1. Install PDF Editor. 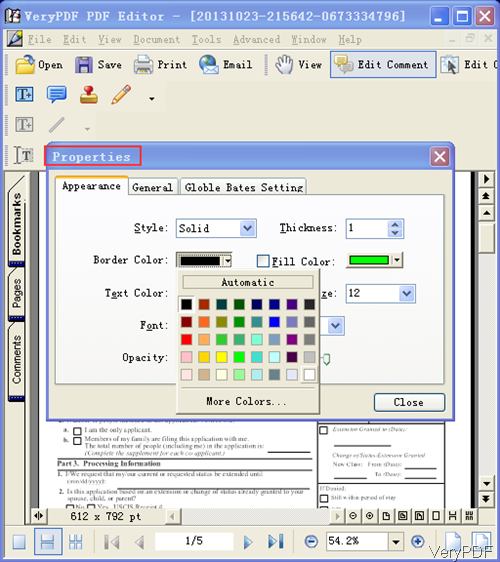 PDF Editor is GUI version, so you need to download PDF Editor first and then install it by double clicking the exe and following installation message. Step 2. Fill PDF form of scan raster PDF form. The following snapshot is from the software interface, please have a check. Please click button Open to add PDF form to software interface. Click button Edit Comment then icons like text , stamp, pencil and others will go black. Please click button T like I showed in above snapshot then you can draw red frame around the text where you need to add a new layer text. Please choose the area and then right click it there will be dropdown list which looks like the above snapshot. Please choose Properties. Then you will see the following menu tab. Please make sure the border color is same with the background color, the font size and color are the same with the original text, fill color should also be same with the background color. When you finish setting, please click button close to back to the main interface. 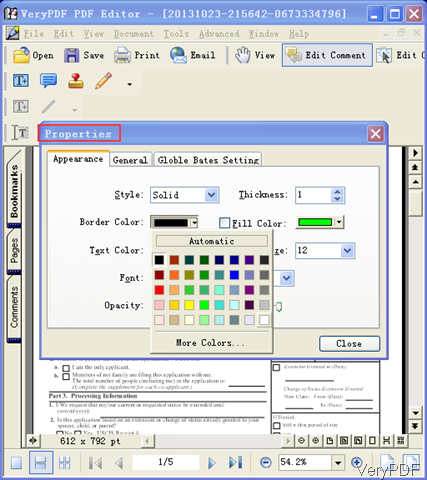 Double click the red frame then you can input text what you need to replace in the original PDF form. This application can help you add a new layer to cover text. By this method and this application, you can fill PDF form on existing PDF forms without pulling out information. During the using, if you have any question, please contact us as soon as possible. How to print a pdf file in the software of verypdf pdf editor? This entry was posted in PDF Editor and tagged fill PDF form. Bookmark the permalink.